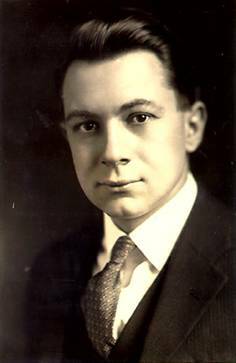 (Randolph Adams). [William L. Clements & George Parker Winship]. THE WILLIAM L. CLEMENTS LIBRARY OF AMERICANA AT THE UNIVERSITY OF MICHIGAN. Ann Arbor: Published by the University, 1923. xii  228 p. Title page woodcut. 8vo. Black quarter cloth and grey boards, paper spine label. Notes: William Clements wrote and edited the work with George Parker Winship. 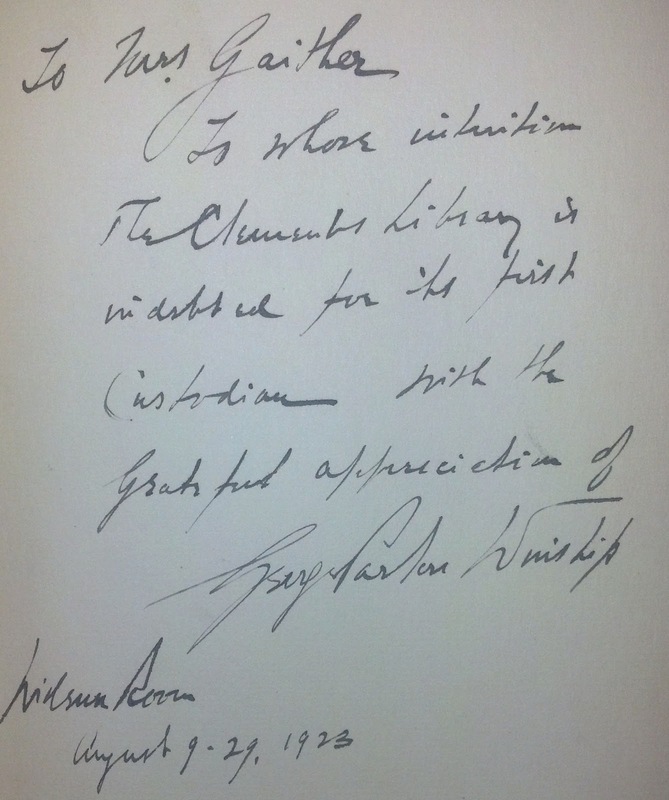 Inscribed, "To Mrs. Gaither, To whose intuition the Clements Library is indebted for its first Custodian, with the grateful appreciation of George Parker Winship, Widener Room, August 9-29, 1923." 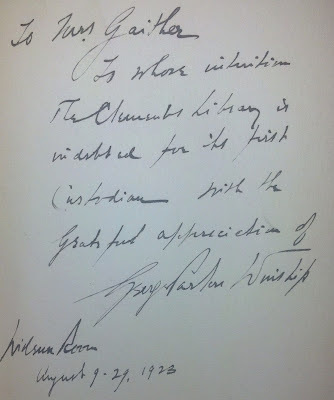 Randolph Adams' ownership signature on the front free endpaper. “The ninth of August, 1923, had dawned unusually cold in Cambridge. George Parker Winship sat before his typewriter at his cluttered desk in the Widener Library. He was answering the latest letter from Clements. Another prospective custodian that Clements was considering, and what did Winship think of him? Winship became aware that someone had entered the room. He looked up to see a pleasant-faced young man [Adams] and an attractive girl [his wife], with one of Winship’s casual acquaintances [Mary Gaither], standing before his desk. Late in August, a young assistant professor of American history from a small southern college was catapulted into the Widener Room at Harvard by an imperious dowager-cousin [Gaither] whose addresses were Beacon Street, Boston, and Hingham, Mass. – names which, apparently, mean something in the Boston area. GPW had neither met nor even heard of the young assistant professor—nor had the latter ever heard of GPW. To add confusion, but no gaiety, the aforementioned Beacon Street matron could not remember GPW’s name, although she had met him at tea the previous winter. Nothing daunted, she barged into the Widener Room a la a Helen Hokinson drawing, introduced the young assistant professor and his wife, and promptly rushed away to shop at Jordan Marsh’s. GPW was stuck with the young couple. He had every reason to be annoyed. He had been interrupted in the writing of an important letter. It was addressed to his friend William L. Clements, and it was a last attempt to get Mr. Clements to make up his mind about the vacant librarian’s chair at the Clements library. The young man…has never been quite certain what happened next. The half-finished letter on GPW’s desk was forgotten. The Winship charm was turned on…. At this point a friend introduced me to Randolph Adams and wife…I have known him four hours. One hour talk about books, an hour going over the library building, two hours at luncheon. On this, I am prepared to guarantee him” (p. 300). Later in the month, Clements met Adams in New York for a long interview. Winship was also present. “By the end of their interview [Clements] had been completely won over by this young man of thirty, a sparkling conversationalist, witty, charming, yet obviously scholarly… Clements summed up his feelings about Adams in a letter to President Burton [of the Univ. of Michigan]: ‘I thoroughly believe he and [Lawrence] Wroth of J[ohn]C[arter]B[rown] will be the forthcoming bibliographical authorities in this country, and their work will redound to the credit of Michigan” (Maxwell, p. 303-304). On August 28, 1923, Adams accepted the job of custodian/director of the William Clements Library of Americana, holding the position with distinction until his death in 1951. Winship’s inscription to Gaither is dated “August 9-29,” spanning the time of their first introduction until notification of Adams appointment.